i got up today and actually got out of the house and took care of some things, even though it was in the low to mid 30’s. i drove down to clear lake and went to my credit union there. i have been needing to close a second savings account i’ve had on my account. i created it the day after tamara told me she was having an affair. i was in shock that she would be doing that, and i was concerned if she could do that and was telling me, that she would then take money out of our accounts. because, hey, if she could commit adultery and was acting like a completely different person, why should i have any belief that she would have respect for my money? and i say mine because in our marriage what was hers was hers, and what was mine was ours. (which is how the divorce went too.) she had a bank account i had no access to, and never asked about. i had no idea how much or little money was in it. her checks for work were put in there. how she spent it was her own deal. my money, on the other hand, went into two joint accounts. anyway, all that to say, i was the primary breadwinner, and if she wanted to commit adultery and treat me like sh!t and leave me, then she had no right to expect access to the money that i provided to our relationship. so i had driven down to clear lake and taken her name off of all of the accounts, atm cards, visa cards, etc. i couldn’t take her name off the primary savings account though, and i didn’t really want to close it and have to get all new checks, new visa card, new atm card, etc. since all accounts were tied to it. so what i did was open a sub-savings account in only my name, then transfer all of the savings account money into it. (i had to keep the minimum in the primary savings for it to stay open, which was like $5 or $20 or something.) that said, a few years later, sometime after the divorce was finalized, i was able to get her name taken off the account completely. but later when i went to collapse the sub-savings back into the primary savings, it turned out i had to be there in person to do it. so i’d just never gotten around to driving down there to do it. so i did today. but i also went down there so i could tell them i am leaving the country for a couple of weeks and will likely be using my credit card. driving down there is always kind of odd, since i have a lot of memories tied to the clear lake area. buildings that were there are razed, businesses changed, new large apartment complexes up, new overpasses and road changes. the diedrich’s on bay area is now a darque tan. in the credit union i ran into a guy that i worked with at lockheed martin (at least i think that’s where i remember him from). we made extended eye contact and i smiled, but he didn’t seem to show any signs of recognition at all. i didn’t talk to him. (that’s a good analogy for that part of my life in general as it relates to me now, actually.) i drove bay area, saturn (which goes near the apartment tamara lived in when i met her), and nasa road one. i ended up going by the bank of america, which reminded me when tamara and i were in there, desperately trying to figure out how to get access to the money for our house closing, which was in a couple of hours (the only time i was ever in that bank). i went by jsc. i saw rocket park. i thought about the buildings i worked in at jsc, the people i worked with. i drove up to the lockheed martin building on nasa road 1 i spent the first four years of my “professional” career in. i saw the convenience store we used to walk to for afternoon breaks. i saw the cheap two-story parking garage beside the building and remembered parking my car and pickup and motorcycle in/on it. i remembered the first time i ever drove down nasa road one, going to my friend tom’s apartment so i could “interview” with lockheed. (they were desperate for people and i already had an offer, i was just checking out the place and the people and such.) i remembered the time i spent at coffee oasis with ash, and other people, and meeting tamara for the first time. going to the waffle house. going to denny’s. and more recent things too, like when i was dating jennifer, or when i’ve had to go down there to do stuff at the credit union, or when the hrc and i went down there one time. all this crap, stored away in my brain somewhere that i hardly ever think about. and i realized just how much i’ve completely forgotten, that i know must have happened but i can’t recall. i spent about 4 years living down there, and about 6.5 working down there. i drove those roads hundreds…thousands…of times. i ate out all the time. i did everything in that area. and most of it isn’t even memories anymore, it’s just ceased to be. since i made the decision to go to taiwan, one of the things i’ve been trying to figure out is how to handle having/using a cell while there. but (there’s always one of those, eh?) almost all u.s. phones are “locked” (even cdma ones) so they can only use sim cards for the cell provider they were sold to be used on. why? because u.s. cell companies offer you a phone at a discounted rate, which is locked to them so you can’t use it elsewhere. this gives them a good chance to be able to recoup the loss they took on selling you the phone cheap (or in some cases, giving it to you for free). that’s why the cell company locks you into a multi-year contract — they’re using your monthly rates to make up for the cell phone you got cheap from them. (more or less.) in most of the rest of the world, you pay full price for a phone, then you use a sim card for whatever provider you choose to use. in the u.s., if certain conditions are met you can request your phone be unlocked. (like if you’re out of contract on the phone, or if you’re leaving the country.) i was hoping to be able to do that with my current phone, which is an iphone. (at&t has an exclusive contract on iphones in the u.s.) i’m not quite out of my 2-year contract, which is sometimes a reason for a carrier not to unlock your phone. but from my googling, it appears at&t will never under any circumstances ever unlock an iphone. bought one unsubsidized for full price? doesn’t matter. met your contract obligation? doesn’t matter. unless you illegally unlock the iphone, you will never be able to use it on any other carrier (in the u.s. or not). so yesterday after work i went over to the at&t store on us-59 near wilcrest. i talked with a guy there about options for the iphone, and said i wanted to get my razr unlocked. he claimed, in no uncertain terms, that at&t has never unlocked phones. i said i read it online, he said i must have misread/misinterpreted. he said he knew of one independent place in houston that could do it. (which is silly, as lots of places unlock phones, including online places remotely.) i told him i’d talked to people who said they’d gotten at&t to do it, he said i must have misunderstood them…because at&t does not and never has unlocked phones. i was kind of annoyed by him, but i didn’t have the facts in front of me so i lost some confidence in my position. so i got info about iphone options and left. Question: What is the unlock code for my phone? Answer: Note: If your phone is an iPhone, the following information does not apply. Please see the topic: What is the unlock code for my iPhone? To control theft of devices and to protect customer security, AT&T only releases unlock codes to customers under certain instances. The unlock code is unique for each device as determined by the manufacturer. If you would like your phone to be unlocked, please contact AT&T at 1-800-331-0500. Question: What is the unlock code for my iPhone? so i called the phone number and talked to a very nice at&t rep who immediately told me he could get the unlock code for me for my razr right then and there, no problem at all. he did. i also talked to him about the iphone. he said he had been told there was no way to unlock the u.s. iphone, other than hacks. i mentioned numerous other countries where people unlock their phones via itunes, so it appears to be possible. he said maybe it was a software difference, but he didn’t know. now — regarding the iphone eternal lock — i’ve read that at&t will refer you to (blame) apple, and apple will refer you to (blame) at&t. i don’t know who did what. but the fact is, iphones in and of themselves have the ability to be legally unlocked. they are sold unlocked in some countries, and in numerous countries where they are sold they can be unlocked (by apple, through itunes) by request through the cell company either for free or for a charge, sometimes after a set period or your contract ends or other times at any time. but not at&t, not in the u.s.
this really kind of annoys me. especially since i had assumed once your obligations were done you could get the phone unlocked no matter what reason you did or didn’t have. to me, if you buy the phone outright, or if you meet the contract obligations, you should be able to have the phone legitimately unlocked. now, i can see why at&t would want to not allow that, since a phone locked to them means it can only be used on their network and thus more money for them, but it seems wrong since you the consumer have covered the cost of the device and it is yours to keep. if apple is the one who set it up this way, i’m guessing it must have been to try and control leakage of u.s. iphones to carriers in other countries. or something. whatever the reason might be, it seems pretty lame to me. spur of the moment? perhaps. i just bought a round-trip ticket. for taiwan. leaving in two weeks. i hope when i tell work tomorrow that they’re cool with it. Author TeRRYPosted on 25.January.2010 @ 22:43 8 Comments on spur of the moment? perhaps. logitech harmony remote glow timer not working? 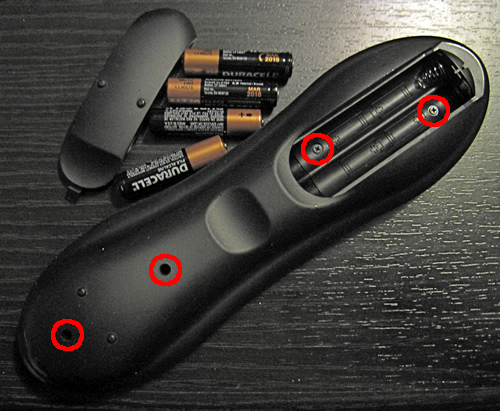 i mentioned a while back on here that a few months ago my logitech harmony remote (model 676) fell off the back of my couch, and after that the glow function would never turn off. the glow button still worked (on and off), but the glow timer didn’t…when a button was pressed that made the glow come on, it would stay on forever. other than that, the remote still worked perfectly. it wasn’t horribly annoying to have to hit the glow button, except when i forgot a couple of times and the batteries ran down overnight. not cool. i did some google searches and could find people describing the problem, but no one had solutions other than going into the software and changing the glow timeout value, and/or reloading the software. i guess that worked for some people, but it didn’t for a lot of others. 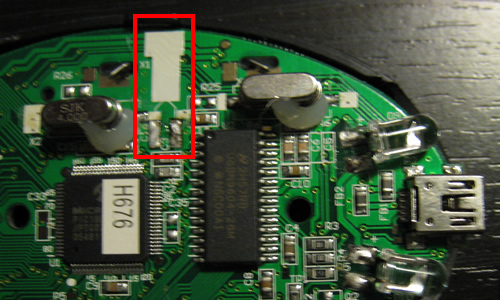 some people were saying this was a known issue and logitech would exchange them under the warranty. but mine wasn’t in the warranty period. i finally gave up and bought a newer harmony remote a couple of weeks ago (model 700). which is nice, although it can’t control as many devices (6) as my previous one (12 or 15 or something). oh well. since i’d already gotten a new one, i decided to take the old one apart and see if i could see anything obvious. i took a couple of electrical engineering courses in college, and have dabbled a bit with electronics and soldering, but when i got it open my reaction was pretty much “yep, that’s a circuit board alright.” “there’s some resistors, and capacitors, and ir lights, etc.” but nothing looked burned or melted or something obvious. i was a bit disheartened, but not surprised by my lack of finding the cause. but then i decided to do some more google searching, and i actually came across a thread where someone mentioned what the problem with their remote had been (describing my situation) and providing a solution. basically, the remote has a 32.768 khz crystal on it, and that is used as the timer for the glow function. in fact, that crystal is used a lot for clocks/timers, specifically in digital watches. if you’ve ever replaced the battery in a digital watch, you’ve likely seen one of these crystals. usually there is a bunch of white plastic, a spot for the watch battery, and you can see this crystal. i came back home, and – having already removed the old crystal a week or two ago so i could take it around with me – i clipped the wires so they were about the same length as the ones on the old crystal, did a dogleg bend on them so it would rest well on the board (and make it easier to solder since i was doing all of this completely freehand), and soldered the new crystal into place. i put the remote back together, put the batteries in, and…my glow timer works again! how awesome is that? well, i thought it was pretty freakin’ cool. anyway, i thought i’d provide some pics for other people who might be having the same issue and are interested in trying this fix. (note that i’m someone on the internet you are listening to, so obviously i take no responsibility if you fry your remote, or your cat, or your house, or yourself, or void your warrenty, or anything else.) even though i have a 676, i assume probably a lot of the remotes use the same crystal. don’t make too much fun of my kr4zy l33t soldering skilz. it works. i mentioned above that the original crystal was lovingly cradled to the board with hot glue, but i didn’t put any hot glue on my replacement. i guess i just like living life on the edge. 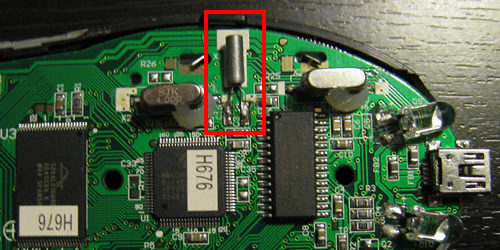 anyway, i hope maybe this will help someone else fix their logitech harmony remote, instead of having to live with a broken glow timer, or shelling out big money for a new remote. Author TeRRYPosted on 16.January.2010 @ 14:00 13 Comments on logitech harmony remote glow timer not working? i also failed to mention a while back that i got a new set of nanini googles (these are brown leather with mirrored aviator-style shaped lenses) and a black “novelty” helmet. that means it fits close to the head and isn’t dot approved as a safety device. i bought the helmet because i thought it’d help hold stuff on my head and keep me warm during colder weather. not sure if that’s true, but i like the helmet enough. very late on the 28th i logged into the online bank account for my visa card — the one where i’d recently had to work to get my name of my ex’s old account — because i was going to initiate an additional payment. you see, i set up an automatic payment on the account so it pays above the minimum monthly payment, then i go in and pay more myself. well, i had set it up. when i logged in, no payment had been made and there were none scheduled. in fact, it was as if i’d never set it up at all. nor did it appear i could any longer set one up. unfortunately, the due date for the payment was the 28th, so by the time i figured it out i already had a late fee. i was paranoid me missing a minimum payment would allow them to up my “introductory” interest rate, so the next day i talked with them. they said they hadn’t yet and i would have to be notified, but it was only one day after the due date. hopefully it’ll be okay. i switched the payment method so another bank of mine initiated the payment (pushing it) instead of the visa bank (pulling it). i’m not sure why taking my name off the joint checking account canceled all scheduled payments i had set up, or why i wasn’t notified of this somehow — but it did, and i wasn’t. wouldn’t you know anything with me involving my ex would screw things up for me somehow? for new year’s eve i once again headed to chris and mary’s for their formal party. since i’m an under-dresser, they’re happy just to get me in a suit jacket. in addition, i wore my grey fedora and my red 8-bit thinkgeek tie. so i still looked like a slob with no fashion sense, but a fake-formally-dressed one. i spent the first part of my night sitting by myself, then finally some people started talking to me and from then on i was involved in conversations. going to parties in general is usually somewhat difficult for me, partially because i’m fairly introverted, partially because i lack some self-confidence, and partially because it reminds me that i am single which makes me sad. new year’s day i ate lunch at the house of pies, then ran some errands. i was trying to get a halogen floor lamp to replace the one in the house that stopped working, but evidently no one makes them anymore. these are the floor lamps that used to cost $20 and exist everywhere and everyone (especially 20’s or younger) owned one. a guy at home depot said they stopped making them because they were too hot and people started fires with them so the companies decided liability on being sued was too much. i did pick up a motion sensor that goes between a bulb and the socket. i put it in the garage where the washer and dryer are. that light bulb tends to get turned on and never turned off, so this way it automatically comes on due to motion and then turns off after 10 minutes. it should save some electricity. i was looking for one of those plastic containers to hold your wrapping paper — i missed getting one last year, and evidently i did this year too. the few left were all broken ones. i might have thought about it earlier if i had cared to buy and wrap xmas presents this year. i did manage to use some best buy rewards money and got a new harmony remote. the one i’ve had still works, but a few months ago it fell off the back of the couch and now when the glow comes on it never goes off unless i press the button. something might be loose in it that i could fix, but i went ahead and got a new one. i got the 700. i didn’t really want touch-screen. unfortunately, it appears the models now limit the number of devices they control. the 700 can do 6. my older one, a 6 series, didn’t have a limit that i recall (or it was higher, because i have 7 or 8 devices on it). anyway, i have yet to set it up. later in the day, i went over to the potts. saturday i ate supper at sylvia’s with the potts clan. it’d been awhile since i’d eaten there. there for awhile i could always count on the hrc (julia) to join me in going at least probably once a month. since she bailed on me, i’ve not gone as often. (over the last couple of months she actually finally started replying to texts sometimes and sort of having some level of conversation with me, but she still acts pretty indifferent about my existence in general and won’t seem to acknowledge anything about feelings or emotions or the past between us. it’s all rather odd, and i don’t really know how to deal with it. i’ll talk about this more some other time.) i actually met the potts at the half-price books. i bought quite a few cds (like 15 or something). i’ll list them in some other entry. today i ate an einstein bagels with the potts, then jack and the boys came back to the house with me and we loaded up my pickup with my old tv and entertainment center. we took it up to jamie’s (amateria) place. we unloaded it, then jamie and her kids and my group all went to best buy and helped her get some electronic equipment. we stopped and ate supper at double dave’s, then went back to her place and jack and i tried to get everything set up and working (tv, dvd, wii, surround sound, plug-in for iphone/ipod. we got everything going (i think) then we hopped in my pickup and i took the potts guys back to their house.